With the release of Marvel’s Avengers: Infinity War on Upper Deck e-Pack™ a whole new achievement adventure has begun! E-Pack is proud to introduce the most expansive marathon achievement program to date, giving collectors the opportunity to embark on their quest to beat Thanos to the punch in collecting all of the Infinity Stones! 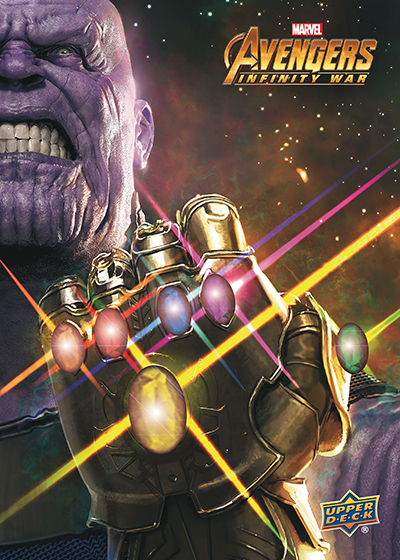 Every Tuesday until 12/18, a new MCU Marathon Infinity Stone Relic Achievements card will be unveiled for a select Marvel Cinematic Universe product currently on the site! These achievement card releases will be accompanied by a set of Precious Metal Gems Purple cards, which will be directly inserted into the remaining inventory of the select product. The first 25 collectors who are able to compile a complete 6 card Precious Metal Gems Purple set each week will be rewarded with that week’s MCU Marathon Infinity Stone Relic Achievements card. So far, we have released the Space Stone and Reality Stone, but there is still time to collect these, and the other 4 Infinity Stone Relics! Get started today on this exciting achievement journey that takes you through many different Marvel universes! Stay tuned for more information on the next release of the MCU Marathon Infinity Stone Relic Achievement and all other exciting e-Pack news by following the NEWS page on e-Pack! **Product depicted for demonstration purposes only and is subject to change without further notice.